A record for a female Old Master and a Rubens with a royal connection was not quite enough to heat up bidding across the latest Old Master auction series in New York this winter. Catalogued as ‘attributed to Agostino Carracci’, this head of a youth sold at more than 25-times estimate at Sotheby’s New York when it was knocked down at $1.2m (£913,000). Image courtesy of Sotheby's. Lukewarm interest at the latest showpiece sales meant that the overall premium-inclusive total of $81.3m (£62.5m) was down on the $86.5m from the equivalent sales last year. Sotheby’s staged three sales in this category at the end of January, while Christie’s held a sole drawings sale, having moved its main auctions in this category to April. Selling rates were slightly patchy but, as always in this selective sector, decent competition did emerge on a handful of high-quality and market-fresh consignments. Ticking both boxes was a group of 13 works on paper consigned by a descendant of the Dutch king William II, reported to be Princess Christina, which was offered at Sotheby’s Old Master drawings sale on January 30. The sale was not without controversy in The Netherlands where members of one of the parties in the governing coalition called for Dutch museums to have first refusal on the works before they were auctioned. Sotheby’s told ATG that “the drawings are privately owned and not part of the Koninklijk Huis (Royal House)”. Measuring 19 x 13in (49 x 32cm) and with cuts to the two corners, 'Study of a Young Man with Raised Arms' by Peter Paul Rubens sold for $7m (£5.32m) at Sotheby’s New York. Image courtesy of Sotheby's. This consignment provided the top lot of the New York series: a black chalk drawing of a young man with raised arms by Peter Paul Rubens (1577-1640). Dated to 1608, it was thought to be a preparatory sketch for his altarpiece The Raising of the Cross. Pitched it at $2.5m-3.5m, it was eventually knocked down at $7m/£5.32m (plus buyer’s premium), a record for a Rubens drawing. Sotheby’s did not release any details about the buyer. 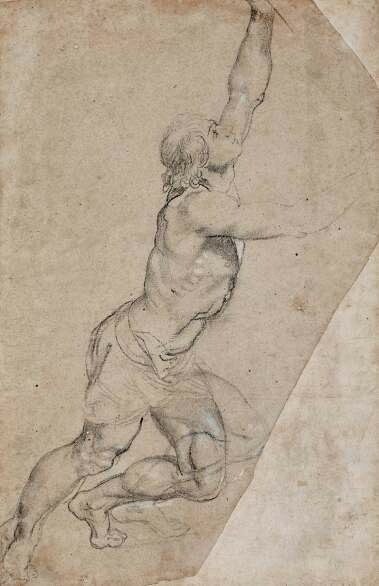 Also from the same Dutch source was a red chalk study for the head of a youth that was catalogued as ‘attributed to Agostino Carracci’ (1557- 1602). Estimated at $35,000-45,000, a number of bidders had little doubt that the impressively lifelike sketch was a fully autograph drawing. It sold at $1.2m (£913,000). At Sotheby’s Old Master evening sale, a number of record prices came among the special assembly of works by women artists branded as The Female Triumphant. These included an impressive life-sized portrait by Elisabeth-Louise Vigée Le Brun (1755-1842) of an exotic subject. 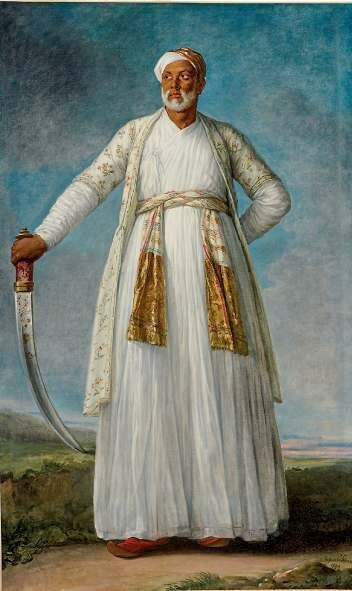 Muhammad Dervish Khan was one of three ambassadors from the Kingdom of Mysore in India who came to Paris in July 1788 seeking the support of Louis XVI in an effort to drive the British out of India. 'Portrait of Muhammad Dervish Khan' by Elisabeth-Louise Vigée Le Brun sold for $6.1m (£4.67m) at Sotheby’s New York. Image courtesy of Sotheby's. The 7ft 5in x 4ft 8in (2.23 x 1.36m) signed oil on canvas was estimated at $4m-6m and drew strong interest before it sold to an anonymous buyer at $6.1m (£4.67m). The price not only surpassed the record for Vigée Le Brun but also set a benchmark for “any female artist of the pre-modern era”, according to Sotheby’s. A total of 11 pictures by female artists were offered in the evening event. They included auction records for Fede Galizia (c.1578-1630), Giulia Lama (1681-1747) and Angelika Kau ffmann (c.1741-1807). Christie’s drawings sale on January 31 was led by a Canaletto (1697-1768) capriccio with an ancient tomb that fetched $320,000 (£244,780), while a Thomas Girtin (1775-1802) watercolour depicting St Paul’s Cathedral was knocked down on low estimate at $180,000 (£137,700). It had previously sold for £125,000 at Chorley’s in Gloucestershire in May 2015.